NASA clearly loves 3D printing as much as we do — to the extent that it's decided to take an entire 3D printer into space as early as next year. The US space agency has co-designed a custom shoe-box sized 3D printer, made specifically to work in micro-gravitational conditions. The hope is that it will make it aboard the International Space Station sometime in 2014. Before that can happen, NASA and co-designer Made in Space will take the printer on one final test flight later this summer to observe it's ability to safely handle microgravity. While that shouldn't prove much of a hurdle — the teams have apparently been working on the technology since 2011 — things can, and do, go wrong in space. 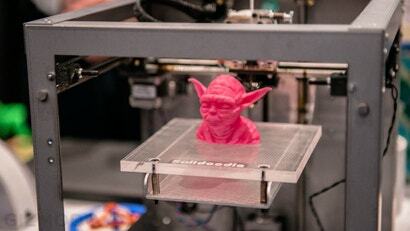 The printer itself is much like any other: it adds layers of plastic or metal to print 3D components additively. Fully enclosed in metal with a glass window on the front, the astronauts will be able to see what's happening inside, while stray material will be stopped from floating around the ISS.